To get as many qualified buyers as possible into your home until it is SOLD! To consistently communicate the results or our activities with you. To assist you in getting the highest possible dollar value for your property, in the shortest period of time, and with the least amount of inconvenience to you! We implement an intense Internet Marketing Program by showcasing your listing on multiple high traffic real estate websites! Beautifully designed custom flyers and brochures to be distributed at open houses, broker caravans, potential buyers driving by and throughout your neighborhood! Postcards - Gorgeous "Just Listed" postcards to be mailed out to potential buyers! Once we list your property we will send out our photographer to take stunning digital photos of your property that will be used for internet and print marketing, as well as your property's video and virtual tour. If you decide to make any visible improvements to the property or have your home staged we'll send them out again to update photographs, making sure your property is featured at it's absolute best! Custom designed videos recorded with full 360-degree views of the property, spectacular photos, highlight important property features, and also available with custom narration. Video can be shared online via YouTube, Facebook, linked to QR codes, and downloaded to DVDs to be distributed to potential buyers. Gorgeous virtual tours promote your property's stunning photographs and allows potential buyers to tour your home virtually on the San Diego's MLS system and most of the real estate sites we use to market your property! Any agent can offer you a for sale sign, our signage is NOT like the competition! 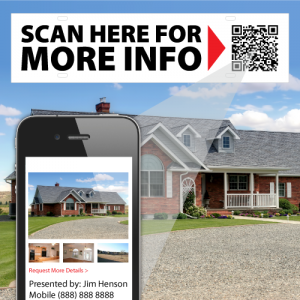 Custom QR code links allows buyers with smartphones to easily scan and learn more about your property while walking or driving by. Personal Property Website riders - we aren't trying to sell ourselves, we want to sell your home! We are able to create custom personal property website riders that highly your property's address and directs them to a customized website about your home! Many home sales benefit greatly from home staging! Staging your home helps buyers visualize themselves in the property. Staging also improves how your property shows which helps bring in higher offers! We can refer you to valuable home staging companies and advise them on how to emphasize the best features your home has to offer! We make sure our listings' open houses are highly marketed to bring in the most potential buyers possible. We do this through internet advertising, networking with buyers we know, networking with other Realtors, and fantastic signage before the open house and the day of! When appropriate, we may showcase your home on broker caravan in your area depending on availability. We follow up with all showings and check in with agents and buyers who have seen your property in order to provide you with their valuable feedback and encourage them to make an offer! Suggest ways to improve salability for your home based on Fair Market Value and advise you as to any initial changes you may want to make to your property to make it more marketable to buyers. Locate qualified buyers through the local and national Multiple Listing Service, open houses, mailouts, mass marketing, flyers, networking, and phone contacts. 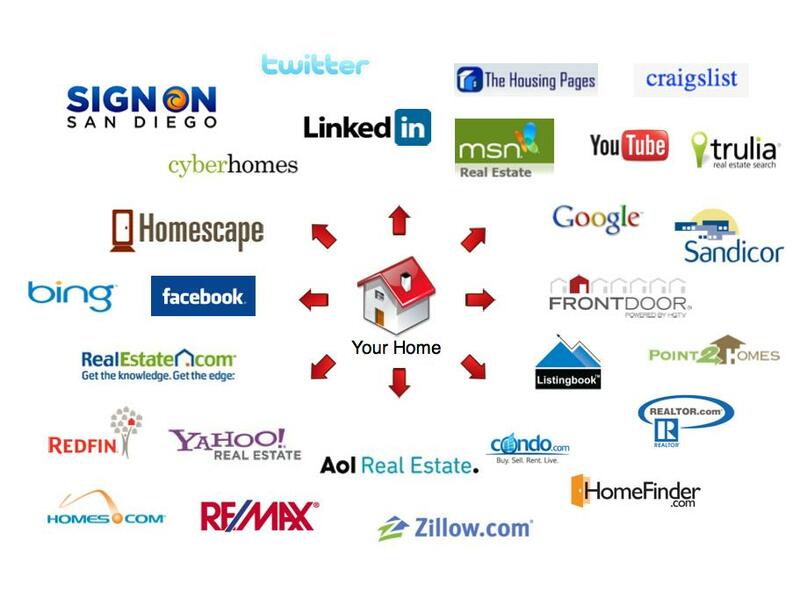 Implement an intense Internet marketing program by showcasing your listing on TeamSpady.com, ReMax.com, Realtor.com, Zillow.com, Trulia.com, Listingbook.com, AOL, MSN, Moving.com, Netscape, Craig's List, SDhomes.com, etc. Design and deliver unique color brochures with a list of the features and benefits your home offers. Promote your home by networking with other top agents in the area for maximum exposure. Design and distribute marketing material to your neighborhood featuring your property. Hold open houses and place "Open House" ads in local publications. Continually update you as to any recent real estate activity so that you know the position of your property in the current marketplace. Provide you with additional exposure by hanging a unique and professional sign, sign riders, and QR code. Advertise 24-hours a day using Listingbook, the only real-time consumer MLS access, and Realtor.com, the the largest real estate site on the Internet. Phone and email all potential buyers with details of your listing. Arrange showings of your property. Keep interested buyers informed of any price adjustments or improvements to the property. Qualify and counsel serious buyers and assist them in the decision to purchase your home. Assist in determining Fair Market Value by reviewing market demand, seasonality of sales, location and other variables which affect the value of your home. Contact you regularly with progress reports and review marketing activities with you. At your request, we may provide you with a website login to view the marketing progress of your property. Answer any questions you or the buyer we have procured for your home have on matters such as financing, payments, insurance and title clearance. I will make detailed arrangements for financing and serve the buyer in dozens of ways that make his/her purchase of your home simple and uncomplicated for you. Keep you completely aware of all various methods of financing that your buyer may want to use and how it will impact the sale of your home. Present and discuss all offers for your property with you. Negotiate on your behalf in all aspects of the sale, especially in regards to pricing and terms, to make sure you are protected. When possible, I will also negotiate with service providers including title companies, escrow companies, lenders, etc. Synchronize buyer and seller transactions. Finalize the closing and assist in all the steps involved in closing the deal. Moving can be complicated, as your agent I will gladly interview and arrange for a relocation agent, if desired, as well as help you find a moving company to assist you with your move.